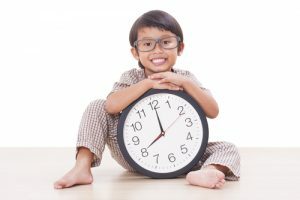 Decades ago, children played until dinnertime, and went to bed without a thought in their heads about scheduling and time commitments. But these days, even young kids have quite a bit to juggle. All of our children either play a sport, take music lessons, or spend time with an after school tutor. Birthday parties and dance recitals fill their weekends, and many kids are at risk of becoming overwhelmed. Help your kids manage their time and responsibilities, and avoid the stress that comes along with an over-scheduled life. 1. Help your child to be a better time manager even at a very young age. Remind your toddler that dinnertime is in a half hour, and ask them to finish their game or their lego masterpiece in that amount of time. Eventually, they will begin to understand how much work they can fit into a given amount of time. 2. Be choosy with your kids activities. Ask your children whether they really want to take piano lessons, or whether the swim team is more important. Help them think about how much time they have outside of school, and work with them to choose the most fulfilling activities available to them, and ditch the ones that simply feel like chores. 3. Make a calendar. Each of your children should have their own calendar, with activities written clearly. Make sure your children understand exactly how much time they’ll be spending on each activity in a given week, so that they can prepare themselves for a busy week. 4. Schedule down time. Make sure there’s some white space on that calendar. More important than any of your children’s activities is a healthy amount of free time each day that will allow your children to simply play, relax, and be kids. 5. Be a good model for your kids. Are you frazzled? Always running late to work and struggling to get household chores done in time for movie night? You’re certainly not alone, and you may never achieve time management perfection! But making an effort to schedule your days mindfully, and modeling good coping skills for stress will teach your kids more than you think! It may be a different world than the one we grew up in, but we can teach our kids to keep up with their schoolwork, activities, and social lives without burning them out. Helping your children to cope with their schedule and to avoid stress is a valuable lesson that will carry them into adulthood.